It is important to develop training sessions to make sure that programme partners understand the basic concepts and develop the proper vocabulary necessary for discussing safe cities for women. Examples of such concepts include: safety as a human right; violence against women and girls as a violation of human rights; the causes and expressions of violence against women and their impact in the daily lives of women; specific forms of gender-based violence in public spaces; the commitments of local governments to preventing and responding to violence against women; and mechanisms that allow the issue to remain invisible; etc. Use techniques that encourage people to speak about their own experiences. For example, an opening question could be, “Have you ever experienced a feeling of insecurity when you were…?” Another example could be activities that ask people to discuss phrases such as, “Women should not walk alone in the city at night,” to generate discussion about the preconceptions and beliefs that support different forms of violence against women. Make sure that programme activities are adapted to the different people who will participate in them in order to make them meaningful. When activities include younger girls, for example, it can be useful to develop models or maps of different public spaces they use (plazas, parks, pedestrian areas) for them to indicate the routes they use, the restrictions in their routes, permissions adults give them to frequent different spaces, and other aspects of the space. This will get the girls to speak about their own experience with the different spaces. This kind of technique shows women and girls that their instincts and feelings are valuable tools for understanding the city and their place within it, and can be helpful for making cities safer places for women and girls. EXAMPLE: Workshop: Geography of violence on the body, Bogota, Colombia. In Bogota, Colombia, workshops were held with women to identify and map the “geography of violence” on the body as part of the UNIFEM Regional Programme “Cities Without Violence Against Women, Safe Cities For All”, implemented by the Women and Habitat Network of Latin American and the Caribbean. 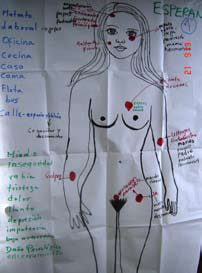 During these workshops, different body parts on a diagram of a woman were labeled with different experiences of violence that participants had experienced. Next the experiences of violence were categorized according to where they had happened or could happen. As a result, a map was produced which created clear links between public space and personal experiences of violence. For more information on this workshop, see Insumos para una caja de herramientas : Programa ciudades sin violencia hacia las mujeres, ciudades seguras para todos y todas (Resources for a toolkit : Programme for cities without violence against women, safe cities for all). Available in Spanish. ACTIVITY: Des-mitificando mitos sobre la violencia hacia las mujeres en la ciudad. (`Demystifying the Myths about Violence against Women in the City’). This activity involves using a series of true or false statements to stimulate a group discussion about the message in the statement. An example of a statement could be: "Women should avoid dressing provocatively in order not to be assaulted or harassed in the street", or "Older women have no reason to be afraid of sexual assault". Statements such as these are good entry points for exploring the myths and assumptions around violence against women. The idea is for the group to discuss whether they believe the statements are true or false, and why. This activity was used in the City of Rosario, in January of 2007, within the framework of the UNIFEM Regional Programme “Cities Without Violence Against Women, Safe Cities For All”, implemented by the Women and Habitat Network of Latin American and the Caribbean. Use simple and clear language and consider your audience. It is important to use simple and clear language and consider your audience when organizing a capacity development training session. Different actors have particular work dynamics, knowledge, and ways of working that should be taken into consideration when developing a training session. It is essential that the training be designed or adapted to take into consideration the needs of each of the actors involved in the safe cities for women programme. Materials should be designed in such a way that makes them meaningful for the participants by using their language or examples that they are familiar with or can relate to. This will make it easy for participants at the training session to understand the concepts that will be explained to them as well as the proposed activities. Learning and training activities should be based on a pre-assessment of the audience’s existing attitudes, levels of knowledge and learning interests/needs. This serves to tailor the content and level of the training, as well as to measure the quality of the training (for example, by utilizing the same pre-and post-training evaluation form for comparison on knowledge acquired by participants). Use examples or stories to demonstrate concepts. Whenever new concepts are introduced, use examples or stories that participants can relate to in their everyday lives to help them to understand the concept. For instance, to explain how poverty increases a woman’s insecurity, you could discuss how poor women have less mobility choices. For example, when a poor woman wants to participate in a recreational activity late at night, she has to get home afterward and may be forced to walk alone through dark streets if she cannot afford a taxi. Furthermore, the physical environment of poorer neighbourhoods is often more deteriorated and unkempt than richer neighbourhoods – this can cause women to feel insecure, and therefore, decide not to participate in recreational activities at night. Activity: “Daily forms of violence against women in the city”. This activity was done in the city of Rosario, Argentina in the framework of the UNIFEM Regional Programme “Cities Without Violence against Women, Safe Cities for All”, implemented by Women and Habitat Network of Latin America and the Caribbean (2007). In order to give visibility to the different forms of violence that women experience in the city, discussion groups were held where women shared their experiences about everyday situations of violence and fear. This type of technique drew on testimonies and story-telling to enable reflection on the different forms of violence inflicted upon women and the avoidance behaviours that women develop due to their perceptions of insecurity. Concepts can seem more interesting, real, and attainable if they are presented by someone who participants know, respect and can relate to (Michau and Naker, 2003). Bringing a role model in to discuss their experiences with women’s and girls’ safety can validate the goals and ideas of participants as they develop their own capacities. Choose role models that participants can relate to and respect such as a woman or man from the area, or other local or tribal elder. When introducing a role model, explain a little bit about their experience with women’s and girls’ safety. Make sure that the chosen role model understands the underlying concepts and ideas being promoted in relation to your safe cities for women and girls programme. Be sure to examine the background of the proposed role model to make sure that they do not have a history or record of any form of abuse or discrimination. Be sure to thank the role models for their time and effort. Example: Draw role models into the process. The Tillicum Lelum Aboriginal Friendship Centre, in Nanaimo, Canada, ran a series of workshops to help women who had experienced abuse and violence. The week-long sessions were emotional and intense, for both participants and workshop leaders. One of the key factors in the success of this project was the decision to bring Elders into the workshops, many of whom shared the same struggles as the participants. Not only were the Elders living proof of healthy and productive lifestyles, but they were able to provide direct inspiration, leadership and support for the participating women (Nanaimo, Canada, 2006). From page 12 of Ministry of Community Services, British Columbia. Community Guide for Preventing Violence against Women. Victoria: Government of British Columbia. Available in English. Encourage women and girls to find their own solutions. Part of building capacity is empowering individuals and groups to come up with their own solutions to the problems they face. In the safer cities context, this is important because women and girls know what makes them feel safe or unsafe. By applying this knowledge, women and girls can come up with safety approaches that benefit both themselves and their communities. This not only ensures that solutions will be appropriate and meaningful for women and girls, but it also ensures that women and girls will feel more in control of their lives. Promote this kind of empowerment by using activities and exercises that encourage women and girls to find their own solutions, rather than prescribing solutions to them. Estrategias para una ciudad sin violencia hacia las mujeres - cartilla de incidencia política (Strategies for a city without violence against women: political advocacy primer), 2009. This primer was created as part of the UNIFEM regional programme “Cities without violence against women, safe cities for all” implemented by the Latin America Women and Habitat Network. The contents of the primer were developed in a participatory process with the “Women for a City without Violence” collective of the West District of the City of Rosario. This collective identified unsafe places in their neighbourhood and then worked with their local government to develop proposals to transform the spaces into places free from violence against women. This primer is a resource for other women wishing to do similar work. It is an empowerment tool for women's local decision-making, participatory management and political advocacy. Available in Spanish. Women’s and girls’ human rights are fundamental to the concept of safe cities for women. This activity helps women understand their rights and how these rights relate to their everyday experiences. Participants begin by drawing a picture that represents a human right. Afterwards, drawings are posted on the wall and the representations are discussed in relation to real life experiences. Source: World YWCA. 2006. Empowering Young Women to Lead Change: Training Manual. World YWCA, Switzerland: page 56. Available in English, French and Spanish. Make sure that the locations selected for capacity development activities are both safe and accessible for all participants. Factors to consider when selecting a site include the following: proximity to public transit, noise levels (quiet places are preferable), the availability of day care services, the time of day (whether convenient or not), among other factors. It is very important that women with particular accessibility needs participate in safe cities for women initiatives. Accessibility problems may be caused by a number of factors, including economic factors, as well as social and cultural factors, or due to physical limitations. Special efforts to include these women should be made since they often feel the most insecure in cities. This insecurity can be increased by a number of additional factors including: responsibility for looking after a child; language barriers; the physical inability to get to safe places in an emergency; isolation; and so on. Because of these issues, women with particular accessibility needs have the most difficulty participating in public initiatives and have the least opportunities to develop their capacities. Therefore, capacity development activities should be planned to allow for women and others with accessibility issues to benefit from them. If women are not used to speaking or working in groups, capacity-building activities and discussions may feel intimidating for them. Make sure that no one is put on the spot so that everyone involved has an opportunity to participate at their own comfort level. It is important to stimulate the participation of everyone involved and to avoid assigning a predominant role to any one participant, or giving more value to the words of a leader than to those of other participants. For example, in situations where one person must represent the entire group, each person in the group could stand up and say who they want to represent the group and why, like a kind of vote. In order to make sure that everyone gets a chance to represent the group, make sure that each person can only fill this duty once. This activity was used in Rosario, Argentina by the women’s group Promoters of a Nonviolent City (Travers, 2008). Involve key actors in capacity-building efforts for safe cities for women and girls. It is everyone’s responsibility to create safe cities and communities for women and girls. This includes governments, public service providers, community groups, women’s groups, educational programmes, faith communities and more. It is therefore important to develop capacity-building activities for each of these key actors, taking into account the role that each could play in a safe cities for women and girls programme. Take into account the different sectors that need to be involved and the tailored training/s and technical assistance implied for capacity development. Making cities safer for women and girls and addressing gender-based violence implies multi-sectoral approaches, with each one making key contributions based on their respective specialized roles—covering urban planning, to health, police, the judiciary, public transport, and so forth. It is important to consider capacity development needs within each key sector as well as across sectors, to achieve the required level of coordination and cooperation for effective responses. Promote learning exchanges between safe cities for women and girls programmes and other initiatives. People involved in safe cities for women initiatives who have experience or expertise in related fields such as crime prevention, women’s issues, local politics, urban planning, leadership or other relevant topics can help other group members by sharing their knowledge and experience in the related disciplines. A good way to build trust between partners working on a safe cities for women programme is to hold a capacity development exchange. Exchanges allow each partner to contribute to the project while building the knowledge of the other partner(s) (Women in Cities International, 2007). For example, a capacity development exchange could occur between the local police force and urban planners. The police could tell urban planners what kinds of spaces attract reported violence against women in the area. In turn, urban planners could tell police how to clearly map out public instances of violence against women. Afterwards, urban planners could study local spaces that are unsafe for women in order to avoid planning mistakes, and police could map out instances of violence against women in order to improve responsiveness. Also, it is important to share the experiences with other safe cities initiatives in order to broaden the knowledge-base and identify the weaknesses and strengths of each experience, taking into account the different contexts and the individual features of each programme. Spaces for the exchange of experiences and capacities around safe cities for women and girls should therefore be created. Strategies should be constructed to evaluate progress, to identify solutions and overcome obstacles, and to take advantage of available resources. EXAMPLE: Equidad de género: compartiendo la ciudad y sus barrios (Gender Equity: sharing the city and its neighbourhoods), 2009. This book records the meeting of the Chilean Housing and Urban Development Ministry’s Neighbourhood Recuperation Programme “Quiero Mi Barrio” (I Love My Neighbourhood) and the UNIFEM Regional Programme “Cities without Violence against Women, Safe Cities for All”, implemented by the Latin America Women and Habitat Network. The book is divded into three sections. In the first section, "Citizenship, Gender, and Neighbourhood Improvement", the activities of the UNFIEM Regional Programme in Chile and other parts of Latin America are presented, as well as the lessons learned in the Programme Quiero Mi Barrio. The second section, "City, Gender, and Violence: other viewpoints", presents academic, public policy, international organization and civil society writings on the issue of cities, gender, and violence. The third section is comprised of conference summaries by Caroline Moser and Juan Manuel Salazar. Available in Spanish. Promote collaboration and exchange among cities and countries. Especially in addressing emerging issues such as safe cities and violence against women and girls in public spaces, strategies and interventions can benefit from learning about the experiences and success stories from other cities and countries, and bringing in expertise and tested training and capacity development approaches to build up critical masses on these issues. The City of Fuenlabrada, Spain, developed a programme called Fuenlabrada’s Holistic Response to Women Victims of Violence Programme. Based on this experience, the Fuenlabrada Municipal Government was asked to provide the City of Rosario, Argentina, with technical assistance to help it with its own victim assistance services. The Agencia Española de Cooperación Internacional para el Desarrollo (AECID - Spanish Agency for International Development Cooperation), through its country offices, supports knowledge transfer and supports Spanish-speaking experts to go and provide training to people in other Spanish-speaking countries. In this case, AECID supported representatives of Fuenlabrada’s local judicial police to travel to Rosario to provide them with the technical assistance they requested (part of the UNIFEM Regional Programme “Cities without violence against women, safe cities for all”, implemented by the Women and Habitat Network of Latin America and the Caribbean). In Rosario, there is an unarmed community police force, the Municipal Urban Guard (Guardia Urbana Municipal - GUM), that is in direct and constant contact with citizens. The objective of the GUM is to promote better safety and urban living conditions in public spaces such as parks, plazas, streets, and recreation areas. The GUM works in coordination with other departments of the municipal government. It approaches safety from a human rights perspective and its main policing function is prevention. It is for these reasons that programme partners identified the Municipal Urban Guard as being the most appropriate city resource to work on preventing gender-based violence and to provide assistance to women at risk of or survivors/victims of violence. Local partners and Rosario’s Municipal Urban Guard agreed that a protocol should be developed for responding to women survivors of violence. The police of Fuenlabrada had already developed a “Protocol of Police Conduct for Cases of Women who have Experienced Violence”. The protocol was developed jointly with the Social Development Department of Fuenlabrada, which coordinates the Holistic Response to Women Victims of Violence Programme. Fuenlabrada’s experience was considered relevant and valuable for the development of a similar protocol in Rosario, so a knowledge transfer was proposed. Fuenlabrada’s Holistic Response to Women Victims of Violence Programme began ten years ago. Over the years, there were many instances where the police and local governments worked in cooperation on cases of violence against women. As a result, the technical assistance offered by the Fuenlabrada police was provided to representatives of the local government of Rosario and to the Armed Police of Santa Fe Province (in Argentina the police report to the provincial government and not the municipality). >Relevant branches of the Social Development Department of the Municipality of Rosario, such as youth, childhood, and sexual diversity. > Share the experience of the Muncipality of Fuenlabrada with the Municipal Urban Guard of Rosario to inform the design and implementation of a Protocol of conduct in cases of violence against women in public spaces in Rosario. > Share the experience of Fuenlabrada’s Holistic Response to Women Victims of Violence Programme with Rosario’s Women’s Affairs Department so that the Department’s response programme to women victims of violence can have a holistic vision. The knowledge transfer should also help with communicating the actions of the Women’s Affairs Department with other government departments, especially to the Municipal Urban Guard. >To provide training and to share the experience of the Municipal Government of Fuenlabrada with women’s organizations that work on issues related to violence against women. >A framework was defined for the development of a protocol in cases of violence against women. >Awareness was raised among officials of the Armed Police of Santa Fe Province and commitments were made for the implementation of diverse actions for preventing future cases of violence against women and for responding to survivors of gender-based violence. >The experience shared by the Municipality of Fuenlabrada allowed the Municipal Women's Affairs Department of Rosario to work with the Municipal Urban Guard to develop a Protocol of Conduct that would make better use of their combined resources. >The key role played by community and women’s organizations in preventing and responding to cases of violence against women was recognized, and organizations were able to make use of resources that were made available to address gender-based violence. [Curso Virtual de Posgrado: Violencia Urbana, Inseguridad y Discriminación: Hacia la Convivencia en la Ciudad desde un Enfoque de Género] (2009). The UNIFEM Regional Programme “Cities without Violence against Women, Safe Cities for All”, implemented by the Women and Habitat Network of Latin America and the Caribbean, joined forces with the Center for Urban and Regional Studies (CURS) and the National Scientific and Technical Research Council (CONICET) to develop this course. The course was designed for people interested in contributing to the prevention of urban violence against women and putting the issue of gender-based violence in public spaces on the agenda of both the public sector and civil society. Specifically, the course was designed for members of governmental and nongovernmental institutions, professionals, and young people. The ultimate aim of this course was to build knowledge among students on how to develop policies with a gender perspective with the aim of promoting a safer and more welcoming city for all. To enable students to reflect on urban violence and violence against women and on how these forms of violence are related. The course uses different theories to get students to reflect on the different ways that violence can be seen to be a risk to society as a whole and to women in particular. To contribute to the development of innovative proposals that aim to build democratic and gender-sensitive policies focused on preventing violence against women in the urban spaces. To share tools and methodologies that help with the design and implementation of safe cities programmes that use a gender perspective. To share innovative ideas and experiences to encourage students to develop creative ideas for solutions aimed at addressing problems related to violence against women in urban spaces. To register for the course or to obtain more information, go to the Spanish website.